Today I would like to present you a CD of mine. 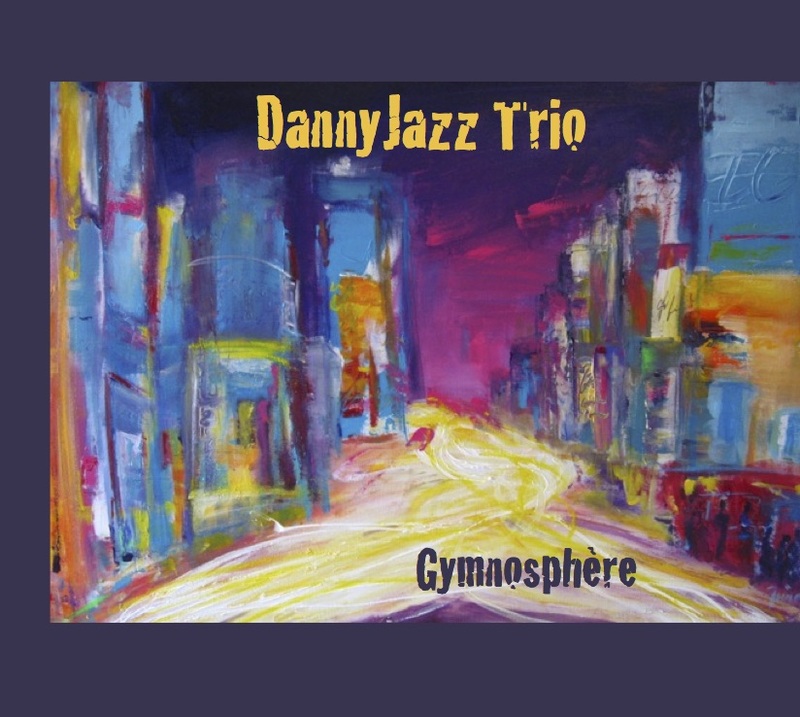 Together with my friends and fellow musicians Daniel Gaggioli on saxophone and Meinrad Thalmann on double-bass we recorded and produced our first CD “Gymnosphère”. Seven of the songs have been written by Daniel, I am the author of one tune and three cover versions of jazz standards have been recorded for the CD. The whole project started a year ago, when we decided to produce our own CD. 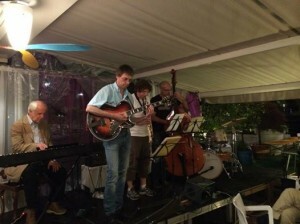 We arranged a workshop in Merano and booked the studio and started to write and select songs. The recording session took three days and all songs have been recorded live in the Splendorstudio in Bern (www.splendorstudio.ch). Big thanks to Martin Kissing for his professional work and his enthusiastic support. In the week before the recording we went for a workshop in Merano, Italy (www.meranojazz.it) where we were able to present our work to the teachers at the workshop and had the chance to play together for a whole week. Special thanks here to Ewald Kontschieder who supported us so perfectly and to Franco D’Andrea who was our teacher during this week and played with us at the final workshop concert. Back to the CD. Daniel wrote a little suite called “An Apple A Day – Keeps The Doctor Away” which was split on the CD as the second and second last song. The title song “Gymnosphère” is a slow and breezy waltz. The last song “Duck Walk” is really humorously and straight swinging with Danny and me playing solos alternately. Daniel plays alto and soprano sax, I use a chorus on some tunes and different reverb effects have been added in the mixing process, which results in a variety of different sounds. “Change Or Quit” is really dry and “Poinciana” and “An Apple A Day” have much more volume. I am really proud of this CD and I have added teasers of all songs at the end of this post. Enjoy listening. We will have a CD party on March 12, 2015 at the Ono in Bern (www.onobern.ch). You can order the CD directly from Daniel (www.danielgaggioli.ch) or from CeDe.ch (www.cede.ch). What was once a main street business has become a niche market: the CD store. The way music is sold has significantly changed over the last few years. Huge CD stores with multiple floors where you could get everything from Bach to Zappa have been closed and the CD stores (even in major cities) are difficult to find. The biggest players are now online with Amazon and iTunes as the leaders of the pack. In addition, streaming services like Spotify use the availability of the web to propose their music “to go”. Entertainment retail stores offer bigger departments for computer games then for CDs, and for the Jazz lovers the choice is typically reduced to the stuff from the marketing campaigns of the big music labels. Shelves of CDs are only equipped with Jamie Cullum, Diana Krall or Gregory Porter. Even if the music is nice and entertaining, once you have bought the CDs there is no need to go into that store again. There is nothing to discover there, no hidden treasures and no local artist you have seen recently in a jam session or a concert. I’m one of those die-hards who love to hold a CD in their hands and carry it around e.g. to listen to it in the car and for that reason I’m constantly looking around where to get new and interesting material. Lucky enough for me, there still is a nice CD store in Bern where you can go to search and discover those hidden treasures. The store is called Roody Be Goode Records and it is right in the center of Bern. 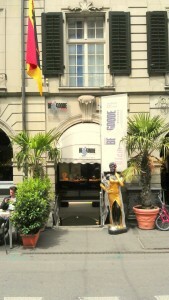 The exact address is Spitalgasse 36. The store is in the basement of the building so from the street you should see only the singing black lady and a banner with the store’s logo but when you take the the steep stairs down you find the biggest selection of Jazz and Blues in Bern. You find all the popular stuff (obviously) but also all the local Jazz and Blues artists. In addition there is also a very nice CD store on the web which I would like to introduce to you: It’s called CDBaby.com. They call themselves the best independent music store on the web and I think that online store is also full of interesting stuff you will never find at the big stores. I discovered CDs from some of my favorite guitar players like Frank Vignola, Bruce Forman or Mark Whitfield on CDBaby.com. This online store gives all those artists that manage their CDs themselves a platform to sell their music online. 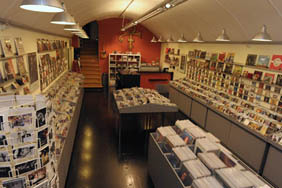 The store is very well organized and you’re able to listen to all the songs before buying. They are able to handle the distribution to international addresses as well, it just takes a little bit more time, but the stuff is well wrapped and your CDs should arrive without damages. And: I received the funniest automatically generated mail ever when my order was being shipped. Finally, I found a third way of buying CDs: Go to a concert and buy the music directly there. If you are lucky, you even get an autograph from the artists making your CD really a collector’s item.